A syndrome is a term given to a group of symptoms that collectively indicate or characterise a disease, psychological disorder, or other abnormal condition. In the case of a fabella syndrome, it indicates an abnormal condition caused by a little bone posterolateral in the knee joint. Posterolateral knee pain can be associated with the presence of a fabella and this incidence may be referred to as a fabella syndrome. The syndrome should be considered when tenderness is found over the posterior aspect of the lateral femoral condyle. The presence of the fabella in humans varies widely and is reported in the literature to range from 20% to 87%. The fabella can be found in 10 to 30 per cent of the population and if it is present there is a 50 per cent chance that it is bilaterally. A familial tendency for an anatomical variant (accessory bone) can be noted in certain cases. Recent anatomic studies suggest that the presence of a fabella is higher in the Asian population. The increased incidence in Asian population might refer to different habits according to kneeling and squatting and therefore increased tensile forces. Another suggested risk factor for developing symptoms related to somatotype; ectomorphic body types are more likely to develop neuropathy than endomorphic. It is potentially due to less insulation by subcutaneous adipose tissue in individuals with ectomorphic somatotypes. Fabella syndrome has been identified as an uncommon, but relevant, a cause of pain post-TKA due to mechanical irritation of the posterolateral tissues of the knee. The symptoms of fabella syndrome are posterolateral pain and a catching sensation (or clicking sound) with knee flexion. Prichett has suggested an association between the presence of fabella and an increased risk of OA of the knee. Some of the symptoms are a pain in the posterolateral region which hurts even more by full knee extension and because of compression against the femoral condyle, there can be local tenderness. Most of these symptoms are the result of repetitive friction of the fabella over the posterolateral femoral condyle. The first was a bony fabella which showed characteristics similar to that of a typical long bone. Compact bone surrounded a core of spongy bone, which had a bone marrow or medullary cavity. Thorough examination at high magnification showed that this trend has adipocytes and connective tissue. There was also found fibrocartilage at the periphery and collagen fibres. The second trend existed out of eosinophilic hyaline cartilage with flattened chondrocytes within lacunae. This was identified as superficial to the subchondral bone. Diagnosis of postero-lateral knee pain and dysfunction can be difficult but is important for a good intervention. Baker’s cyst, lateral ligamentous instability, meniscal tears, and proximal tibiofibular joint hypomobility should also be considered. There are other multiple anatomical structures that could be the source including postero-lateral corner structures, the ilio-tibial band and the biceps femoris tendon. Irregular appearance of fabella may be confused with a foreign body. On MRI it can appear like a posterior abnormality of the femoral condyle which sometimes can be interpreted as an osteochondral defect or loose body. However, this loose body is easy to differentiate from the fabella because the fabella moves away from the lateral femoral condyle during knee flexion. The fabella bone can be detected by palpation, Magnetic resonance imaging (MRI) and ultrasound. Knee Injury and Osteoarthritis Outcome Score (KOOS) questionnaire evaluates the functional status and quality of life (QoL) of patients with any type of knee injury who are at increased risk of developing OA; i.e., patients with anterior cruciate ligament (ACL) injury, meniscus injury, or chondral injury. Physical examination may reveal the presence of swelling/tenderness in the posterolateral aspect of the knee. Palpation of the fabella may suggest the presence of a firm nodule in the left posterolateral popliteal fossa, medial to the tendon of the biceps femoris, and approximately 1 cm in diameter. The range of motion shows that the exercises of the active investigation which are most likely to be sensitive are deep squatting, full extension of the knee. Assessment of accessory motions of the fabella in the medial-lateral and superior-inferior direction should be performed. Joint play examination of the proximal tibiofibular joint and the patellofemoral joint should be done to differentiate the fabella related symptoms from the patellofemoral and proximal tibiofibular joints. General screening for the integrity of knee joint structures included varus-valgus test, Lachman's test, anterior-posterior drawer test and traction test is necessary to evaluate the cruciate ligaments, collateral ligaments, and menisci and exclude other causes of posterolateral pain. Radiographs and sometimes ultrasound are used to confirm the presence of a fabella sesamoid. Magnetic resonance imaging can be valuable to exclude other causes of knee pain. In addition, magnetic resonance imaging may show changes associated with fabella irritation, inflammation, thickening of the lateral gastrocnemius tendon, and evidence of grooving of the articular cartilage on the posterior lateral femoral condyle. Fabella pain syndrome should initially be managed conservatively but if symptoms persist surgical resection of fabella with the appropriate reconstruction of the posterolateral corner of the knee, is a definitive treatment effective. Injecting local anaesthetics or steroids near the site should be performed as a first intervention. Non-surgical treatment includes steroid injection, immobilization with splinting and casting, temporary restriction of activity, physical modality, manual therapy and analgesic agents. Radial extracorporeal shock wave therapy (rESWT) is gaining attention as a new treatment strategy for various musculoskeletal problems, because of its effectiveness, noninvasiveness, and applicability. rESWT entails three thousand shock waves being delivered at a frequency of 12 Hz. This procedure can be performed at two-week intervals for a total of one to four times. The mechanism of rESWT involves the destruction of the unmyelinated sensory nerves, hyperstimulation analgesic effect, and neovascularization in degenerated tissues. In one series, post-treatment, patients noticed a sudden decrease in pain intensity: in three cases, pain intensity ranged from an eight to a one; and in one case, pain intensity ranged from a four to a zero. These decreases in pain intensity scale remained at a two-month follow-up clinical visit. However, in patients who do not respond to nonoperative treatment, surgical treatment may be performed. A fabella excision can be successfully performed either as an open or arthroscopic procedure. Research suggests relief of symptoms with physiotherapy. Manual therapy may be a temporary solution. The use of mobilization of the fabella and the soft tissue of the lateral gastrocnemius followed by medial, lateral and inferior glides of the fabella causes an immediate reduction in posterolateral knee pain. It increases tolerance for activities involving knee flexion, extension and rotation. The limited active knee flexion can be improved to a full range of motion of the knee joint. The common peroneal nerve can be mobilized in the lateral direction away from fabella. 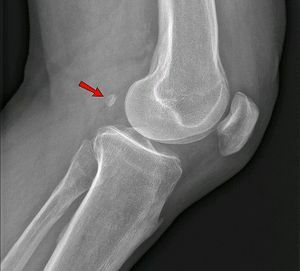 A clinical case report by T.Zipple et al suggested a reduction of symptoms in a patient by self-management technique of flexing the affected knee to 90 degrees in prone and then pulling the leg in an upward direction by a relative. According to the study  after an open fabella excision, there is no restriction on the range of motion (ROM), and flexion/extension exercises are initiated immediately postoperatively to avoid loss of motion. A brace is not routinely used. The patient is allowed to bear weight as tolerated with the aid of crutches until they can ambulate without a limp. Typically, crutches are necessary during the first 2 weeks postoperatively. However, the use of crutches is at the patient's discretion. Ankle pumps, straight leg raises, and quadriceps exercises are initiated immediately postoperatively as tolerated and frequency gradually increased to 3 to 5 times daily. Return to competitive activities is allowed after approximately 3 to 4 months when the capsule and soft tissues have healed sufficiently. ↑ 1.0 1.1 1.2 Driessen A, Balke M, Offerhaus C, White WJ, Shafizadeh S, Becher C, Bouillon B, Höher J. The fabella syndrome-a rare cause of posterolateral knee pain: a review of the literature and two case reports. BMC musculoskeletal disorders. 2014 Dec;15(1):100. ↑ Eriko Okano, Tomokazu Yoshioka, Takaji Yanai, et al., “Fabella Syndrome as an Uncommon Cause of Posterolateral Knee Pain after Total Knee Arthroplasty: A Case Report and Review of the Literature,” Case Reports in Orthopedics, vol. 2016, Article ID 4328462, 5 pages, 2016. https://doi.org/10.1155/2016/4328462. ↑ Phukubye P1, Oyedele O.The incidence and structure of the fabella in a South African cadaver sample. Clin Anat. 2011 Jan;24(1):84-90. ↑ 6.0 6.1 6.2 Provencher MT, Sanchez G, Ferrari MB, Moatshe G, Chahla J, Akamefula R, LaPrade RF. Arthroscopy-Assisted Fabella Excision: Surgical Technique. Arthroscopy techniques. 2017 Apr 1;6(2):e369-74. ↑ 8.0 8.1 Seol PH, Ha KW, Kim YH, Kwak HJ, Park SW, Ryu BJ. Effect of Radial Extracorporeal Shock Wave Therapy in Patients With Fabella Syndrome. Annals of rehabilitation medicine. 2016 Dec;40(6):1124.